Passion. Be it for another being or for a craft can make for interesting reading. We are all guilty to blindly following someone or doing something without rationalizing why we do it. And the hurt when that occurs when we fall because of our blind passions creates some uneasy situations. And that is the beauty behind the novel Serafim and Claire by Mark Lavorato. It was madness, and she knew it. Yet Claire Audette could not help needing to hear that song on the phonograph again, one last time, before she picked up the telephone. She watched the device (a second-hand Victrola) from her bed, where she shivered under a pile of duvets and blankets that she had wrapped tightly around herself, shuddering uncontrollably, her teeth clacking in her cheeks, a deafening woodpecker in a forest of thoughts. Thoughts she was aware, that were drifting helplessly towards delirium. Her fever was on the rise; and she could be sure of this by the way the coldness in her muscles was sinking, deeper, into her bones, into the marrow beneath them, turning the jelly there into grating grains of frost. She felt like, even if the fever were to pass, she would never really warm up again. Not fully. Lavorato takes two different people – Claire Audette and Serafim Viera – with the same drives and passions. Claire is a dancer trying to break into the nightclub scene of 1920s Montreal. Serafim is a photographer who is exploring new ways of his art with little success. Both are driven and both have had their hearts broken, but foolishly or not, they still continue their ways. Sunday was not a day of rest for Serafim. There was church to go to, and after the service (before the public at large retired to their social clubs and private dinners for the evening) most of the population would spend an hour or two promenading through the pruned grounds of the Palacio de Cristal, a florid garden situated at one of the highest points of the area, overlooking the city of Oporto and the banks of the Douro, where they parted from each other and folded out into the open sea. At times the massive and ornate gardens would be so crowded that people had to shuffle through with elbow room alone, brushing against women with their piquantly sweet perfumes and the contrast of the white dresses and black shawls, the fabric fluttering like doves taking flight at their feet as they walked, while above, a knot of swan necks seemed to emerge through the dark embroidery at their shoulders and peck at the height of their elaborate hats. Men stepped smoothly in their Sunday best, elegantly poised, bow-tied, and pulling the gold chains of their pocket watches just to make sure that, indeed, all the time in the world was still theirs. For a photographer, the opportunities were endless. It is no secret that eventually that Serafim and Claire will meet. But it is the journey that brings them together that makes the story interesting. Lavorato is brilliant with description – be it a scene or with an emotion – making the novel great to read. When they could feel the wind again, Claire turned around to face her friend and new roommate, who was nestled in the leather of the open back seat, holding on to her hat once more. Claire giggled at her, the mansions of Sherbrooke Street now dwindling in the distance; and as they receded, so did the possibility, in Claire’s mind, that the thing she had just done would ever be able to follow her. Her friend, like a champagne bottle foaming over with jubilation, suddenly threw back her head and laughed, one of her arms spilling out over the back seat, flailing into the night behind them. She and Claire laughed up at the stars and into the long pearl boulevard of the Milky Way. It was the beginning of summer 1920. They were seventeen. And the times – you could feel it – were changing. Serafim and Claire by Mark Lavorato is a book about passion and drives. It explores that element of the human condition in a well written fashion. No doubt one of the best books of this year. 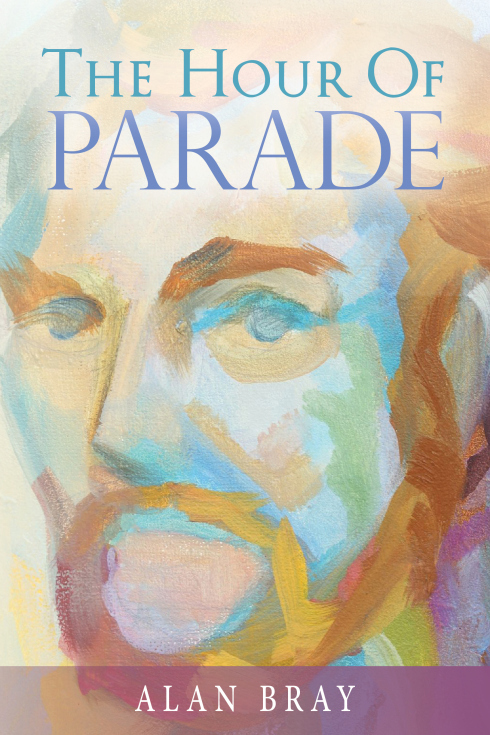 Alan Bray (AB) has recently self-published his first novel “The Hour of Parade” A gripping and emotional book (Link to my review here) Bray was kind enough to answer a few questions for me. 1) How long have you been writing? What inspired you to start writing? AB: I started writing fiction about fifteen years ago. Inspiration—restlessness, love of literature. 2) “The Hour of Parade” looks it was self published. What inspired you to do that in that format? Did you put your own funds upfront to publish a ‘printed’ book? AB: Yes, self-published through CreateSpace, which is part of Amazon. I had submitted earlier drafts to several agents and publishers; I didn’t receive much interest and felt a lot of frustration with the process (and I’m very familiar with the process from writing and submitting short stories). I think it’s very difficult to persuade traditional publishers to take a chance on a first novel by an unknown writer. When I’d completed another draft and felt ready, I self-published. More royalties, more control, less aggravation. The downside is that you’re shut out of some channels, and there’s an understandable prejudice. 3) Having a Russian and a French soldier come together in Munich in 1806 is an interesting concept for a novel. What was your inspiration for coming up with that story? AB: I learned that, after the Austerlitz campaign, the French army went into winter quarters in Munich and stayed through much of the summer of 1806. The soldiers had a lot of time on their hands, I understand. Bringing Alexi there was artifice, yet seemed plausible. 4)You used Goodreads to promote your book. What was that experience like for you? Did you use any other platforms to promote yourself? AB: I owe thanks to the CreateSpace designer for that. I’m not sure where she got it; it looks like a Cezanne. I wanted a portrait on the cover, nineteenth-century, but the ones I found were copyright protected. I like it too. I tried to write Alexi and Anne-Marie very close and intimately, and I think the cover captures the idea of almost painful self-awareness. 6) What has been the reaction to “The Hour of Parade” so far. Will you be doing any speaking engagements for it? AB: A few very good reviews. I’ve just hired a publicist to try to get the word out more. AB: They certainly inspire me to write in general. I think being a musician educated me about the artistic mind set, meaning the necessity to create intensely personal things and then perform them publicly. And the need for disciplined practice and patience. I make a point of writing 2-3 hours a day, even if it’s rubbish. 8) Are you planning any new writing projects at the present time? AB: Yes, there’s a novella that’s supposed to be published this spring, details are still a little sketchy. I have another novel pretty far along. It’s another Napoleonic Era setting, in Poland at the siege of Danzig (now Gdansk) in 1807. I was in Gdansk several years ago and it really inspired me. Beautiful place. And I’m always working on several short stories. Tanis Rideout (TR) is a Toronto, Canada poet and author. While both of my reviews of her works on my blog (Link to my review of “Above All Things” and link to my review of “Arguments with the Lake” received very positive responses here, her novel has recently been placed on the long list for the International IMPAC Dublin Literary Award. She recently agreed to answer a few questions via email for me. 1) You write both poetry and fiction. Is there one form over the other that you prefer to write or are they equally the same for you? TR: Poetry and fiction are both tremendously appealing. Up until very recently I’ve always bounced back and forth between projects – having a novel I’m working on and a poetry project. It’s a great way to take a break and keep working – to go from the massive scope and size of a novel to the tiny detail work of poetry and vice versa. I hope that each of the practices feeds in to the other. TR: I love Atwood, and Hemmingway, Alessandro Barrico. I like writers with a mix of poetry in their prose, for sure. I just finished reading The Goldfinch – which was such a huge book that I feel like I need a little breathing room. I’m teaching a class at the moment and so am re-reading Francine Prose’s Reading Like a Writer. 3) I recently reviewed a poet who became ecstatic over the review I wrote about her work. She said I was the first reviewer who didn’t complain that “her words didn’t rhyme.” Do you find that poetry suffers from a ‘stereotypical’ image that keeps readers away? TR: Oh! absolutely! I think there are people who are attuned to what poetry is now, but most of us walk around with a dusty old image of it, put in our heads in school, mostly by teachers who were terrified of poetry as well, and so couldn’t really instill any love or awe in us. And I think finding your way in, as a casual reader can be difficult – where to begin? Who to read? It can be much more difficult to find something that will speak to you, though I have no doubt with enough looking almost anyone will find something that moves them. 4) Are you planning any new writing projects in the future? TR: I am. I’m currently at work on a new novel. I’m hoping to have a first draft done in the spring. It’s strange to be back to the early stages of the process – the finding your way around in this dark room part of it – but exciting as well. 5) How has the reaction to “Above All Things” been since it’s release? TR: The reaction has been really great, I feel really fortunate that it’s been received so well. It’s quite terrifying to put this thing out into the world that you’ve held so tight and worked so hard on then send out to be judged. But it’s so fantastic to go to book clubs and events and have people talk about the book, and be excited by it. It’s been really astounding. 6) There seems to be quite a bit of research involved with “Above All Things.” Did that take quite a bit of time? What exactly did you do to research it? TR: I did do a ton of research – which I love! If I could just do research and never have to write anything I might. I started out by just reading everything I could get my hands on about Everest, and George Mallory and 1920s climbing – online, in the library, in old bookstores. It’s amazing in this day and age what you can learn from the comfort of your own home. But I also received a grant from the Canada Council early on, part of which was to be spent on travel and research and so went to England where I spent lots of time at the Royal Geographical Society reading letters and documents from the time. It was extraordinary. 7) I have seen both “Above All Things” and “Arguments with the Lake” on the readings lists of several different reading groups/book clubs. Have you had much experience in dealing with such groups? If so, explain. TR: Yes! I’ve been to quite a number of book clubs for Above All Things – some small events in people’s homes, who have just tracked me down through my website, and some others, that are larger community events. It’s an extraordinary experience to go and sit in a room full of readers who are attentive and engaged in something that you’ve written – they’re passionate readers, people who are in book clubs, so they have opinions and ideas. It’s great to see them forget a little that I’m there and just really get in to what they thought of the book and its characters. 8) Environmentalism is an important theme for you. Is there anything else beside you do besides writing to promote that cause? TR: I’m involved with an organization here in Toronto called Lake Ontario Waterkeeper. They’re an environmental justice organization committed to protecting our rights to swim, drink and fish our watersheds. I try and do whatever I can to help promote their work. 9) I just found out that “Above All Things” made the long list for this year’s IMPAC DUBLIN AWARD (Congrats!) How do you feel about this? Does recognition like this help with any future writing projects. TR: The IMPAC Longlist is pretty extraordinary – there are some truly astounding books on it! It feels really great to be included on a list like that, and of course, it’s great affirmation for the work that’s been done. It’s really nice to be able to remind myself of those things when I’m stuck on new work, or feeling really lost. It’s nice to remember that somehow I found my way out of it before! 9) You have a steady presence on Twitter. Does social media help you in your writing at all? TR: I’m not sure that Twitter and other social media help with writing necessarily – but it does feel like it connects me to a community – of both writers and readers, which is a really wonderful thing. Fans of crime fiction should note that author Rick Blechta will be again mixing his passion for music and writing into another crime novel. The Boom Room is expected to be published in April 2014. While this was a quick and light read, Blechta does include some elements from his experience in his music career that make this a interesting book. Detective Mervin Pratt is called in to help at a murder scene at a popular downtown nightclub. The manager of the club has been stabbed to death and the lead investigator thinks the case can be closed in no time. But Pratt isn’t so sure and starts to take the investigation on his own. But Pratt finds himself in ethical ‘hot-water’ when his partner informs him that the suspect is his estranged half brother. Although a light read, many fans of the Toronto music scene will be somewhat familiar will the sets and actions that Blechta uses in this book. And the dilemmas that Pratt encounters are realistic enough for fans of the genre to enjoy. The thing that drives many of us to read literature is the fact is that we know humans are not just good or bad. There are complex levels in each of us depending on the situation we encounter and our station in life, etc. etc. Literature deals with the human condition and when a good writer explores the different hues of characters and leaves a reader wondering which of their characters is really moral or immoral, well, that makes for a fantastic read. And that is what Dan Vyleta has done in The Crooked Maid. Page 6-7 There was little about him that was remarkable: a young man dressed in black, with a stiff white shirt and dark, patterned tie, holding a book closed upon his lap. He was perhaps eighteen years of age; too slender yet to be thought of as a man; rich (how else would he be able to afford the first-class ticket? ); a boy very plae, with a mask of freckles sitting lightly on his face; the hair nearly black, thick and falling low into his forehead; the brows long and straight, sloping gently to the temples. There was something wrong with his eye, the one that faced the window and found its own reflection in the darkness of the pane. It looked as though it had been beaten, broken, reassembled. Its white was discoloured and it drooped within its socket, giving a new note to his face, of belligerent reproach. His shoes were made of a shiny black leather and looked as though they had never been worn. Vyleta has skillfully woven a web around a group of characters set in post World War II Vienna. Anna Beer has returned to the city after nine years to confront and perhaps forgive her husband’s infidelity. Eighteen-year-old Robert Seidel is coming back home to his stepfather’s sickbed and must deal with his family’s complex history. They both encounter a war-widowed American journalist, a hunchbacked servant girl, and a former POW trying to survive. But most of all, there is a ghost of man who’s head is wrapped in a red scarf and watches them all. As Vienna rises from the bitter ashes of the war and tries to deal with de-Nazification, each one must come to terms with their lives and the lives of the people around them. Page 85-86 Anna Beer did not notice the girl who was sitting on the stairs above her apartment when she returned home that evening, having walked for some hours in the inner city before dining in the restaurant of one of the hotels. She was a young girl, unremarkable if rather pretty, save for a craped and painful twist that held in lock the shoulders, neck and spine. One her head there perched a red, outlandish hat that did no favours to her complexion Had Anna been less tired from her long walk in the city, and less preoccupied with the sense of anticipation that rose in her every time she approached the apartment door (for was it not possible that this time, at long last, she should find her husband home and they would finally go through with their long-deferred greeting and be free to explore what remained of their marriage? ), she might have noticed that the girl kept her face averted as she stepped into her line of sight, then stared after her with ill-masked curiosity. Indeed there was something impatient, unsettled about the girl. She had been sitting on the stairs for more than an hour, rising periodically to stare out the window at the sagging ruin of the building’s back wing and starting at every step that sounded in the stairwell, and at every voice that carried from below. Periodically she had lit a cigarette and calmed herself by blowing rings into the air above her head before crushing the fag end into the stone of the stairs. there were three such shreds of paper and tobacco dotting the space between her feet. Vyleta is an expert in describing a scene or telling of an action. His writing in this book was a pleasure to read and re-read. While Robert lay, tracing metacarpal bones beneath the white of Eva’s skin, too shy even to press them to his lips, elsewhere in the city a man and a woman, long married and as such familiar with each other’s hands and mouths (and much else besides), sat up in bed discussing a letter, hand-delivered that afternoon, which pertained to their youngest son. Encrypted as it was in a densely bureaucratic German, and as such illegible to both husband and wife, the letter’s only assailable point came in the form of an underlined heading that read Ladung, a word that, depending on contest, might be translated as “ammunition,” “load,” or ‘”summons,” and seemed to absorb the more sinister aspects of each meaning with successive reading. A crow watched their argument (for an argument it quickly became, split along lines of gender, in which the woman’s role is to protect her child, and the man’s to toughen him up) with considerable interest, the jerked, pecked at its feathers, converting parasites to food. a moment later it dropped from the windowsill, fell groundward then skyward, with an ease that might have startled Newton. High up it fell in with some brethren. They flew into the failing moon. 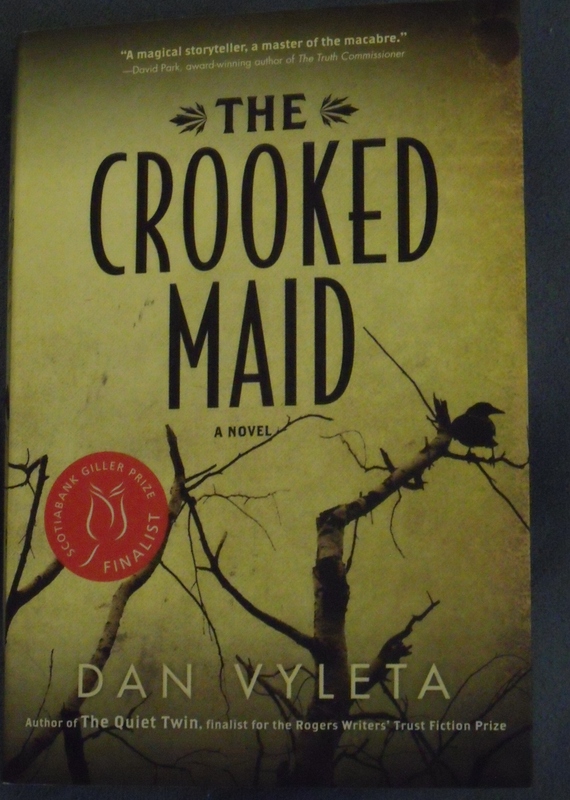 While The Crooked Maid by Dan Vyleta is a complex book, it explores the human condition in all its hues. Vyleta has written a complex story that weaves characters in and out of each others lives but it is a story well worth the time to read and understand. 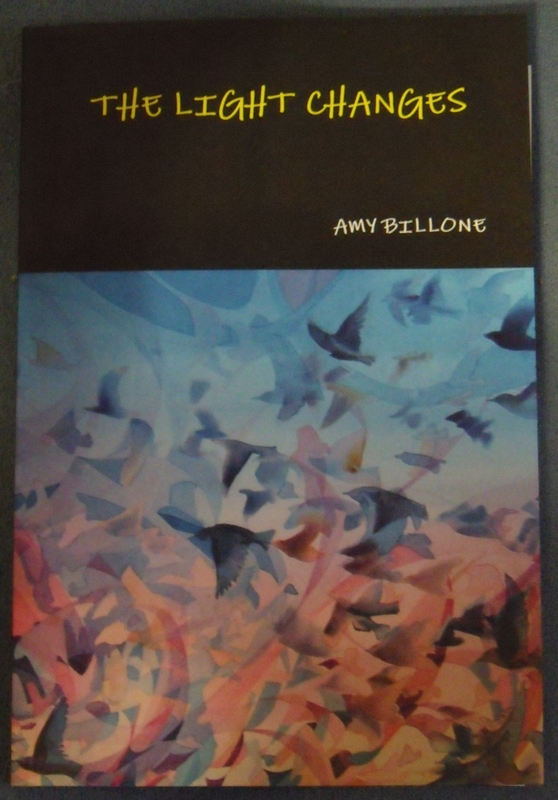 Amy Billone has recently published a book of poetry called “The Light Changes” (Link to my review). She holds a Ph.D. from Princeton University and is currently an Associate Professor of English at the University of Tennessee. She lives in Knoxville with her two sons. I have always written poems since I was a young child. For this reason, I think—because I associate poetry with my first written words—I have never seen it as being inaccessible or alienating as a genre the way others sometimes do. I need to write analytically for my job as a professor so that is another form of writing I will always work in. However, I am driven to find new forms of creative writing and I will try anything I am able to do. I am excited about the idea of discovering or inventing a new genre to write in: one I have never tried before. Anything is possible for me at this point. My favorite poet in English is William Wordsworth and my favorite book of poetry is Wordsworth’s The Prelude in all of its versions. I am currently reading the 667 page volume of the 1798, 1799, 1805 and 1850 versions to my sons who perhaps to humor me recently asked me if I could read the book to them again when I finished it. I laughed and told them I would happily read it to them as many times as they wanted until they move out (they are 6 and 7 years old). My favorite living poet in English is W.S. Merwin. I just re-read Robert Louis Stevenson’s Strange Case of Dr. Jekyll and Mr. Hyde and Oscar Wilde’s The Picture of Dorian Gray together with the sonnets of John Donne and George Herbert for the two classes I am teaching at the University of Tennessee. I love to experience the interaction between dissimilar works and to notice the impact that earlier writers have made on very popular art forms across a wide range of media today. 3) How has the reaction been to “The Light Changes” so far? Do you find that poetry suffers from a ‘stereotypical’ image that keeps readers away? Overall I have been happy about the reaction to The Light Changes. I was extremely moved by the starred Kirkus review. I do think poetry suffers from a stereotypical image that keeps readers away. My own book is full of references to other writers, poets like Elizabeth Barrett Browning and Jack Gilbert and Sylvia Plath and fiction writers like Virginia Woolf. If you do not know these writers’ biographies or their writing, some of what I am trying to do in my book might be lost. Poetry can be difficult to read. Yes. I am currently completing a scholarly book about dreams and childhood. In terms of my creative work, I have hundreds of pages written but not yet with a specific form or shape. This is actually how I write most of my poetry in the early drafts. Right now, I am still trying to decide what form I will put these particular words in. I keep imagining alternate genres. I am eager to find a voice that will reach as many people as possible and that will reach them in the most effective way. 5) Does your role as associate professor help you with your writing? Do your sons inspire you to write? I think my work as an Associate Professor and my work as a mother to my sons complexly give me inspiration for my creative writing and at the same time give me hurdles to overcome. Both are very time-consuming jobs. The challenge becomes how to channel the incredible intellectual and emotional energy that is generated by these different aspects of my life into my creative writing while at the same time remaining a serious scholar and a devoted mother. 6) Do you (Or did you do any) public readings of “The Light Changes?” If, yes, what was the experience like for you? I have not yet done any public readings of The Light Changes. I became excited about the idea of making an audible version of the book, which is now available on Amazon, Audible and iTunes. I discovered that I loved narrating my poems—performing the various voices in the book, as if it were a kind of play. Reactions to the audiobook have so far been very positive. 7) You used Goodreads.com to promote your book. What was that experience like for you? Have you used any other social media websites to promote yourself? I used Goodreads and Kirkus and Facebook and Twitter to promote The Light Changes. Goodreads and Kirkus both did Giveaways of the book. The Giveaways were a bit frightening for me. I have had to realize that not everyone will respond to my book in the same way. So much of this process for me has been about taking risks. At the moment I can say I have no regrets about the way the book has been promoted. I long for an audience. 8) The illustration on the cover of “The Light Changes” is very interesting. Is there a special link there for you? My discovery of Maria Klawe’s Starling Flox (2005) as a cover image for my book was a miracle made possible by the digital revolution. After years of thought, I decided to search Google Images for the word “starling.” I was drawn to starlings because the last poem in my book is about watching starlings fly from a tree to a river at sunset. When I saw Klawe’s painting it blew me away. I felt everything I was expressing in the book was brilliantly conveyed in her gorgeous art. I was thrilled when she gave me permission to use her painting on my cover. Snapshot of the cover of “The Light Changes.” Artwork is “Starling Flox” by Maria Klawe (2005) and photographed by Johanna Stiebert. 9) You seem to talk about a lot of travelling in “The Light Changes.” Are you planning any big trips soon? I will be travelling to the University of Houston to chair a panel devoted to dreams and nineteenth-century energies at the Interdisciplinary Nineteenth-Century Studies conference at the end of March. I will also be travelling to the UK this summer to present at a conference that will celebrate the 250th birthday of Gothic writer Ann Radcliffe at the University of Sheffield. I have a passion for travelling. 10) How has living in Tennessee been for you? I had never been to Knoxville, Tennessee when I interviewed for my job at the University of Tennessee in 2000. At the time, I lived in New York City. I have always loved big cities. Living in Knoxville has been relaxing. It is a quiet contained place where I can gather and focus my energy in between trips to other places, whether real or imaginary. I’ve had a frantic, unsuccessful week of trying to increase my “profits,” and ignoring my “leisures.” Yet somehow the fates spoke to me. My recent readings of the works of P.K. Page and the discovery of the publishing house of Wolsak and Wynn have led to previous posts here. But then as I raced by one of those “new books” sections and looked in between a collection of pulp novels, I discovered a copy of Her Red Hair Rises With The Wings Of Insects by Catherine Graham. Of course, I picked it up and had to talk about it here. I’ve often thought about you. on your way through you own nocturnal route. Most of the poems Graham’s has in this book, started off as glosas (The opening fours lines of another poet’s work are ‘woven’ into the last line of each of four ten line stanzas.) But Graham has added a lot of her own personal touch to each work. In many cases dealing with passion and trying to define that emotion. between the lines of each stanza. Clouds shift to receive new registers. Graham writes in the introduction that she calls both Dorothy Molloy and P. K. Page her ‘spirit mentors’ while writing this book. Indeed she has extend their ideas into her work, but even Graham’s own words are enlightening. the echo of my echo? is cut and I’m pure. I miss my slip of water. This was a wonderful collection to read. No doubt I will be reading it again and again. of night the white shoots up. spin calm into a bleach explosion. dark stirrings are welcome then. It was a strange timing of fate that I found Her Red Hair Rises With The Wings of Insects by Catherine Graham but I am glad that I found it. It fed my intellectual need right now and I have no doubt I will be checking out more of her work. The story deals with Liv Bloom. She recently landed a scholarship at Wickham Hall, a private New Hampshire school. She is excited to get out of the foster system back in Nevada and things seem to be going great, – especially when Malcolm Astor starts falling for her. Fellow scholarship kid Gabe Nichols warns her about getting involved with a “Wicky” but Liv doesn’t heed his warnings. Liv is murdered and, in death, she finds out that she is the victim of a 150-year conspiracy that involves many other girls. Talkington has written a great novel dealing with many of the angsts that all teens deals with but the real beauty of the book is how she has Liv refer back to famous art works and artists in her descriptions. If a teen has an interest in art, they will gladly learn a few details about famous works and artists by reading this book. Liv, Forever by Amy Talkington is an interesting book that should not only be enlightening for young minds but entertaining as well. An item the other day got my attention at a used book sale. While it was only a $1 and it was meant for children, I was extremely enlightened by A Thousand Peaks: Poems from China by Siyu Liu and Orel Protopopescu. And it deserves a few words of mention here. In China, Poetry began over five thousand years ago. The first poems were songs. At festivals and other important events, people composed new lyrics to go with familiar tunes. They sang their thoughts and feelings to each other. Court musicians sand during official government meeting to help politicians negotiate. Imagine songwriters sing in Congress today! The first know collection of the ancient poems, the Book of Songs, was written on bamboo sticks around 600 B.C.E. This book was a pleasure for me to look through. 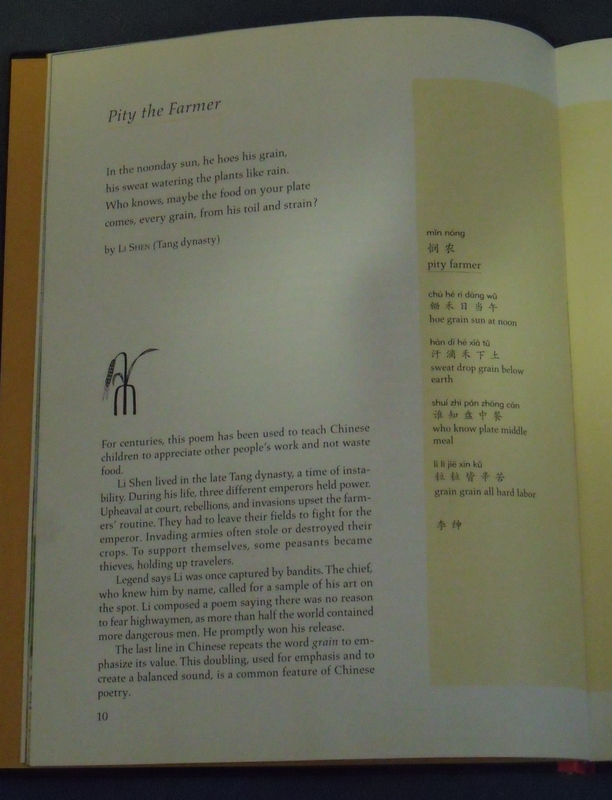 Not only does it offer excerpts of Classical Chinese poetry but gives a history lesson into each era. And it is colourfully illustrated with wonderful prints. his sweat watering the plants like rain. comes, every grain, from his toil and strain? For centuries, this poem has been used to teach Chinese children to appreciate other people’s work and not waste food. Legend says Li was once captured by bandits. The chief, who knew him by name, called for a sample of his art on the spot. Li composed a poem saying there was no reason to fear highwaymen, as more than half the world contained more dangerous men. He promptly won his release. Each section also includes a literal translation of the poem so one can appreciate certain aspects of how the poem would sound in it’s original form. A Thousand Peaks: Poems from China by Siyu Liu and Orel Protopopescu may have been a dollar find for me but it was worth triple it’s weight in gold. An enlightening read for whomever reads it- young or old. 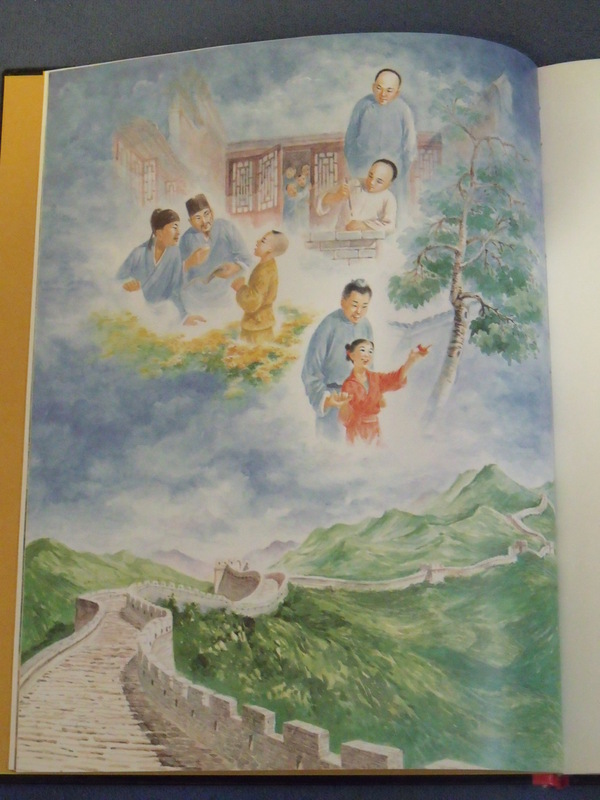 Snapshot of Page 9 illustration. Done by Siyu Liu. Passion on the Road to Revenge | Review of “The Hour of Parade” (2013) by Alan Bray. self published. There was a time when there was a specific code of ethics for every little facet of life. A slight against one person needed to be avenged against another. Strict guidelines on how social classes interacted with each other had to be followed. And dress was all so important. So what happened when people’s desires got in the way of that code? That is the interesting options what Alan Bray explores in novel The Hour of Parade. The bells rang one o’clock, the end of parade – a time when soldiers are at liberty, disappointed that there’s been no news to break their boredom. He walked up a lane that promised to take him back toward the Marienplatz, occupied by Marianne’s absence. Look for me tonight, that’s what she said; tonight – a time as distant as the horizon of a graying, wind-blown steppe. His footfalls echoed and disappeared against windows made from sheets of plate glass. The street was much better drained than those in Brest-Litovsk or Kracow, the gutters swept clean. But here and there, patches of dark ice touched the cobblestones, and he shortened his stride to avoid a fall. Down the narrow passage, a closed post chaise swayed toward him and to avoid being run over, he pressed back into a watchmaker’s doorway. Within the scattered echo of the hooves, the chains, and the snap of the postilion’s whip, the bells of the cathedral rang the quarter-hour. He stepped out once the way was clear, looking over his shoulder at the receding chaise, curious about its haste. “Oof!” The wind left his lungs, bringing back all the pain that had been absent during the past month. As he bent over struggling to catch his breath, two figures pressed close to his right flank; to his left, a pair of foreshortened shadows loomed across a building’s wooden façade. Set in 1806, Bray has written a brilliant historical novel. Russian cavalry officer Alexi Ruzhensky travels to Munich to kill the man who killed his brother in a duel, French Officer Louis Valsin. While an uneasy peace exists after the battle of Austerlitz, Ruzhensky has problems to deciding to seek revenge or let the matter slide has he gets to know Valsin. Matters are complicated as both have strong love interests who also are seeking an end for their own means. … Marianne unpacked her clothes and comb. Soon dresses and white stockings hung over the end of the bed, and by the hearth, tiny women’s shoes stood in line next to men’s boots. In the midst of these things, a letter arrived from his father, and he placed it on the table, facedown and unopened. At first he didn’t understand her; she’d used a rather formal term to refer to something elemental, polishing it, as if it were a precious mineral or an ore, a fragrant wood grown in her garden. Beauty, youth – like happiness – were native resources, were things of value worth guarding. He studied her; she’d had to spend some of what she owned. Bray has written an excellent historical novel. Through it, does a reader not only learn about the time period but also of the thought patterns of the time. Bray has done an excellent research job and has written a book that goes beyond what any historical text can do for the era. The dinner was planned with all the attention given a minor campaign – a campaign within a campaign – not only the mundane issues of what to eat and drink but the finer points of conversation as well. He prepared several topics, developing his positions with care and making allowances for spontaneity. With regret, he chose a black evening jacket with silk stockings and civilian shoes rather than his uniform, a costume that certainly might lead his guests to unpleasant associations. Bray also has an excellent grasp of language. His words give a reader a perfect image of what is going on in their mind’s eye. The gutters ran with gurgling torrents. Like a wash of varnish, a coat of moisture remained on the cobbles. Faint light from lanterns made the street glisten and shimmer, made pockets of mist appear, full of shapes. In her chest, the night air was a rheum of fog. She took his arm, and they set off in small strides to avoid slipping. Against the cobblestones, their footsteps jolted with rhythmic pressure, driving the wine and mist from her mind. The Hour of Parade by Alan Bray is an interesting and enlightening read. It is at times gripping and dramatic as well. A perfect book for any history buff.